In the painting the artist depicts evangelical episodes. Jesus fasted in the wilderness forty days, at the end he felt hungry, and then, appearing to Him, the devil persuaded: “If You are the Son of God, make the stones around become bread.” To which he heard the answer: “Man shall not live by bread alone”. In the second episode, the devil persuaded Christ to rush from the roof, and in the third – to bow to him. These evangelical episodes complement the ritual of cleansing the leper in the foreground, as described in the Old Testament. The devil took Christ to the roof of the temple and persuaded him to rush out, because God would not allow the death of the beloved Son. Raising Christ on a high mountain, the devil promised Him all the kingdoms of the world, if He would worship him. When this temptation was rejected, the angels came and served Christ. 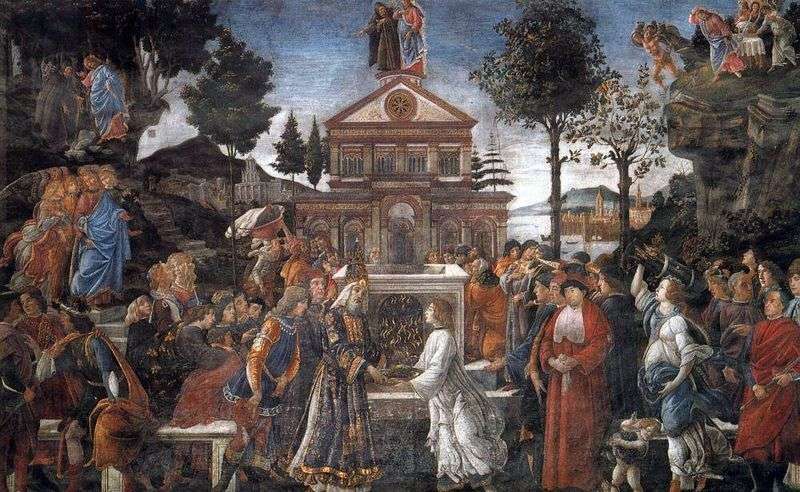 In the depiction of scenes, Botticelli uses the portraits of his contemporaries, who play the role of witnesses of what is happening. It is believed that in the corner of the composition on the left are depicted himself and the artist Filippino Lippi, the son of his teacher, who worked for some time in the workshop of Botticelli. The extreme figure in the composition on the right in the red cloak is Girolamo Riario, the nephew of Pope Sixtus IV. In the group standing near the altar in the vestment of the cardinal, with a thoughtful look is depicted Giuliano della Rovere, the future Pope Julius II. Description and meaning of the painting The Healing of the Leper and the Temptation of Christ by Sandro Botticelli.